USB drives are a really convenient way to transport and share data. Unfortunately, they also represent a really easy way to lose sensitive data, and can act as an infection vector to spread malware from one computer to another. Now, ESET and Kingston have teamed up to address this security hole. 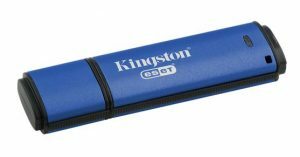 Introducing the Kingston DataTraveler Vault Privacy 3.0 with DriveSecurity anti-virus powered by ESET. It’s a USB 3.0 drive with built-in 256-bit AES hardware-based encryption to safeguard your data, plus a pre-paid 5-year subscription to ESET’s DriveSecurity anti-virus protection, which is pre-installed and pre-activated. It’s available in capacities of 4 Gb, 8 Gb, 16 Gb, 32 Gb, and 64 Gb, with prices as low as $39.99 for a single, 4 Gb drive. The drives are customizable to meet specific corporate requirements, such as minimum password length, and the number of incorrect password attempts allowed before the drive locks down and reformats itself. They can also be co-branded and serialized for businesses who purchase multiple drives.